Horizon PPM - Project Management for today's mobile, digital and global teams. 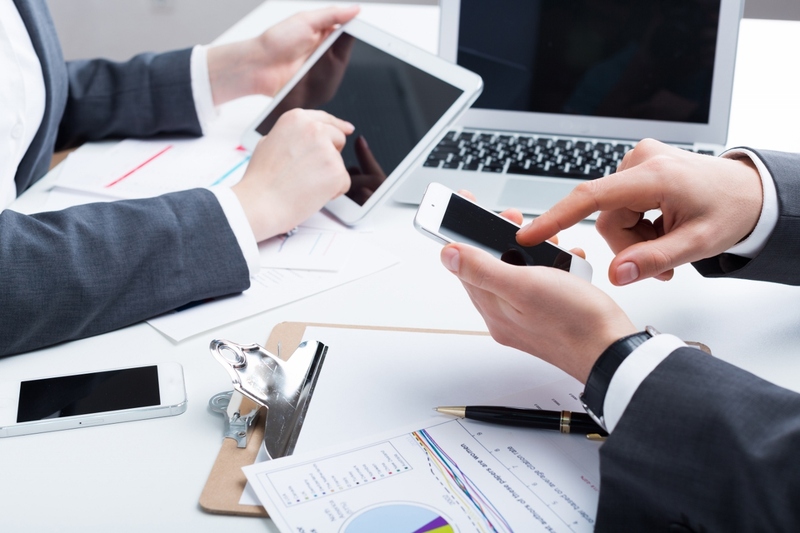 Project Management for today&apos;s mobile, digital and global teams. 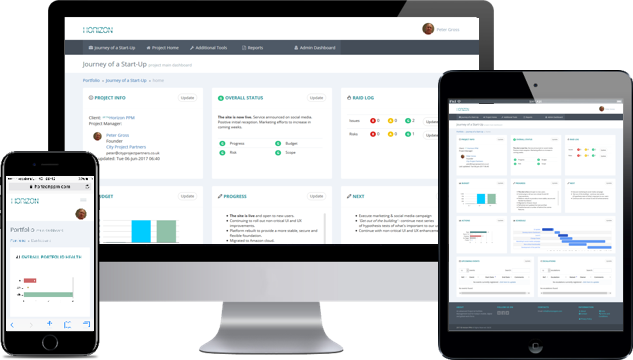 A 360-degree dashboard of your projects activities, risks and opportunities. Zoom in/out between project details and portfolio views putting a lens on all challenges and opportunities. Use the same tool for execution and reporting to reduce unnecessary administration overheads. Leverage real-time data as a powerful spotlight to support critical business decisions. Work with anyone, anywhere, anytime using this always-on cloud hosted service using devices you already own. Focusing on what&apos;s important. Split the signal from the noise. In a recent survey the vast majority of the project managers we spoke to told us they develop their own tools to track and report their projects - even when corporate solutions are already in place! 8 out of 10 reported that they spend anywhere between 4 hours and 2 days writing reports each week - and over 65% of them don&apos;t believe their reports are read until the information is already stale - or they&apos;re simply not read at all. The modern work force is global and mobile. Waiting for status reports to be circulated at a weekly review meeting should be a thing of the past. HORIZON PPM provides all project members with access to the latest updates regardless of location or timezone and on devices they are already using. A project dashboard shared with the whole project team. Put everyone on the same page. The easy navigation and consistent layout of HORIZON PPM is the key to quick access to relevant information and informed decision making. The Small Business edition is FREE to sign-up and use for as long as you like. It's ideal for personal projects, start-ups, students, small charities and community groups as well as small businesses. Our commercial versions offer even more features and remove the usage limits Professionals, Project Managers and larger Enterprise users. ... very beneficial to project/programme/portfolio managers, project sponsors and project teams to get a high level view of each project in progress and how it might impact them. 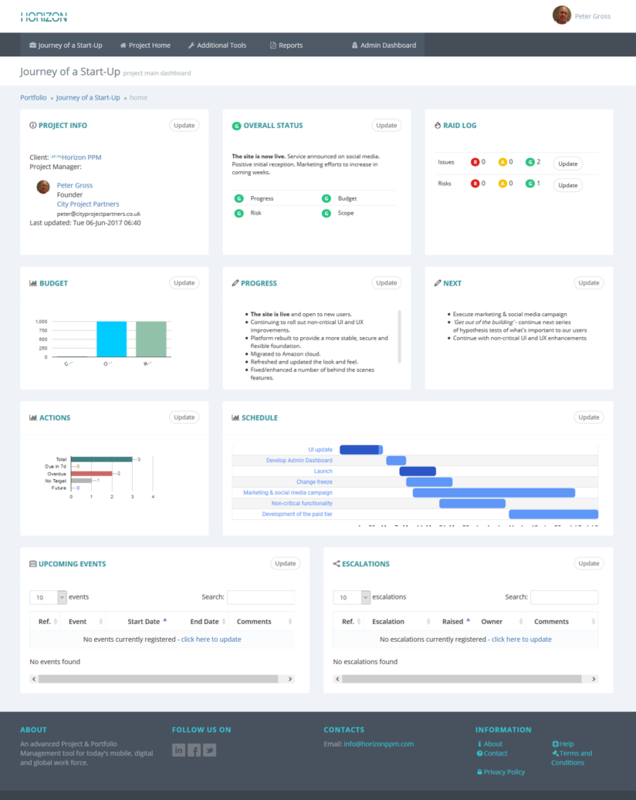 ... helps you and those involved think logically about the project and gives visibility to the key aspects of a project via the scorecard/dashboard. key needs required for effective project and portfolio management. A tool for a Project or Programme Manager designed and delivered by someone who understands what should be readily available. HORIZON PPM - Project Management for today&apos;s mobile, digital & global teams.